Medical Manager ICD-10. Yes it is compatible! Jaydee Corporation can make your version of Medical Manager print and send the ICD10 diagnosis codes. We have been supporting physicians offices and billing services since 1978. The Jaydee Corporation provides long-term computer solutions to physicians' offices. Jaydee is comprised of a team of professional consultants, we are primarily committed to computerizing your office in the most effective and least disruptive manner. Recently, Medical Manager users started seeing rejections from several carriers on paper claims due to missing taxonomy codes. These specialty codes are now required in the shaded portion of box 24j and in the billing information field 33b. Let Jaydee Corporation fix these formats and any other missing data on your HCFA 1500 forms. Is Medical Manager compatible with Windows 10? If you updated your computer to Windows 10, it's possible that Medical Manager won't work or it may not print after the upgrade. Yes, Medical Manager version 9 and up can run on Windows 10. Windows 10 can be setup to look and work very much like Windows 7 or XP with the familiar START BUTTON and START MENU. Medical Manager version 8.12 DOS will only run on 32 bit Windows operating systems, including the 32 bit version of Windows 10. If your server is running LINUX, UNIX or SCO OpenServer, then your workstation computers can be running any version of Windows. Many offices are still using their original server. If your server is between 5 and 15 years old, It's critical that these systems are replaced, or at least serviced. Vacuum dust from all openings. Remove the cover, replace any bad fans. Inspect capacitors for bulging or leaking. Bad capacitors will cause intermittent server crashes and outages. If needed, Jaydee can help you replace your system for a very reasonable price. Depending on the operating system version, you may be able to purchase a new compatible computer. In some cases an OS upgrade and license will be required. We can now setup SCO OpenServer to run on a Virtual Machine with VMWARE. This will allow your SCO UNIX to run on any Windows server. Existing licenses can usually be transferred. Is Medical Manager compatible with ICD-10? ICD-10 is working on The Medical Manager! The deadline for ICD-10 compliance was October 1, 2015. Updates and more information can be found at http://www.cms.gov/Medicare/Coding/ICD10. THIS SHOULD BE WORKING ON YOUR MEDICAL MANAGER SYSTEM! Stop writing or typing in the missing boxes on your CMS forms. Your computer should be doing the work for you. Don't believe the people who tell you "ICD-10 is not possible on your version of Medical Manager"! IT WORKS! The new diagnosis codes will begin with a letter and have a length up to 7 characters. All versions of The Medical Manager can handle this with some custom format changes. The new CMS form has fields for twelve diagnosis codes. We have an update to properly print these new CMS 1500 (02-12) forms. Our new CMS ICD-10 paper claim formats will also work if you are sending print image claims to Office Ally clearinghouse. We now have an EMC claim format with custom ICD-10 segments for sending the new required data. This ICD-10 EMC format will only work with the Practice Insight clearinghouse. At this time MMNS and some other clearinghouses may not be able to convert and process the NSF claims that older versions of Medical Manager produce. Practice Insight is a full featured clearinghouse that can accept claims in many formats from several different practice management systems. Compatibility with different Medical Manager versions is no longer an issue. They have an incredible web interface that allows you to fix and resubmit claims online. You can easily track claims, run reports, transfer to second payer, send electronic patient statements, print timely filing letters and more. Call Jaydee for more info or to switch over to Practice Insight. You should already be using new Encounter Forms or Superbills. The ICD-10 deadline was October 1, 2015. We suggest printing a list of your current ICD-9 diagnosis codes from Report Generation-->Support Files-->Diagnosis Codes ( or /M1402 ). Determine which codes you use, and lookup the appropriate ICD-10 equivalent code. The codes can be entered into the Medical Manger now, but they should only be used on service dates of October 1, 2015 or later. Some insurance companies may not be ready by that date. Your staff may have to code differently for certain payors. Don't delete the ICD-9 codes, they are probably attached to patient history or may be required for rebilling. After October, you may want to put a 'zz' in front of the description of your ICD-9 codes. "Remember when you bought your Medical Manager system years ago from a small locally owned business. When you had a problem, someone would answer the phone and help you immediately. Jaydee is one of the few surviving original support companies for Medical Manager. We know the program and can keep it working for you." Jaydee Corporation is now totally independent and separate from The Medical Manager Corporation and WebMD. We will continue to support users of The Medical Manager. For many years we were an authorized dealer. Let our extensive experience with this system work for your office. We can provide remote access service using your dialup modem or Internet connection. From Virginia to Oregon, if you are having Medical Manager problems, call Jaydee! YES - We still support Versions 8.12, 9 and 10. (version 11 and 12 too!) We will not "force" you to upgrade. Maybe you just have a small problem to fix. We will not require you to sign a two year contract and buy a new LINUX server for several thousand dollars. Call Jaydee! If you need a quick callback and fast resolution to problems, we also offer support contracts. This is what your CMS-1500 insurance claim form should look like! Box 24d should have alpha characters A, B C... , NOT NUMBERS 1, 2, 3...! If you use Medical Manager's Laser Form Generator to print your claims on white paper, we now have an update to generate the new form. The NUCC approved the following transition timeline at its in-person meeting way back on August 1, 2013. This timeline aligns with Medicare's transition timeline. Don't order the old forms! 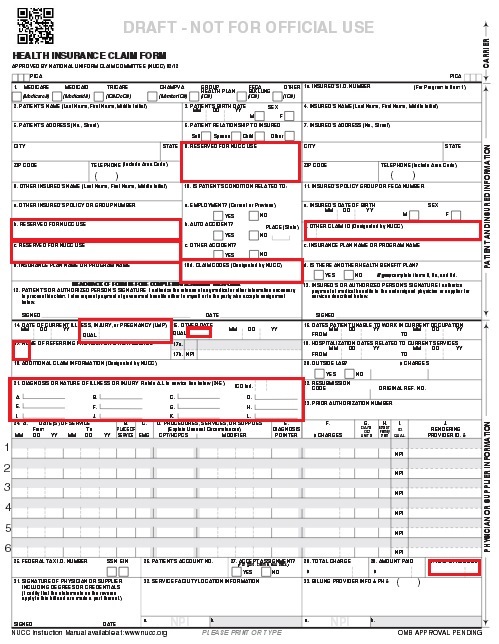 Specify "FORM 1500 (02-12)"
Stop using WhiteOut and your typewriter on your forms, we can fix them! Box 21 has been changed to accommodate 12 diagnosis codes and an ICD 9 or 10 indicator. Your current insurance format files and laser form generator setup must be changed. Several other fields have been changed. What's up with Vitera? Are they trying to make you upgrade? to an entirely different system? They cut their support staff...and hired salespeople. Jaydee Corporation is a service and support company. Protect your investment. Your Medical Manager system is working for you. You know to use it. We can keep it working. Did your server get trashed by a hurricane? Flood or storm damage? Bad Capacitors? We can build a new server for your practice. We know how to restore your Medical Manager backup tapes or data cartridges. No Backup? Hard disk crash? We are a certified Kroll OnTrack Data Recovery partner. BACKUP YOUR DATA TO A FLASH DRIVE! Are you sure that your backup is working? Do you get a printed report each morning confirming a successful backup? If your tape backup is failing, you could lose all of your practice's current financial data. Don't wait any longer. In many systems the Medical Manager programs and data can be compressed and backed up to an encrypted flash drive. Let us configure your system to automatically backup to a set of secure affordable flash drives. Your data will be password protected. If the wrong password is entered more than 5 times, the drive reformats itself. How much are you spending to replace your DAT tape drives? Jaydee now offers a method to backup your data to a secure remote data center. Each night your data can be encrypted and backed up automatically over your Internet connection. Provide your practice with protection from fires, hurricanes, thefts and other disasters. We can help you fix most insurance billing problems relating to your legacy IDs and NPI numbers for your facility, billing, rendering and referring doctors. Do you have a fatal error preventing your billing or daily close? Missing fields on your forms? If you have old WordPerfect files, progress notes, patient letters, etc from WP version 5 or 6, we can transfer these documents from your SCO OpenServer UNIX server or your old Windows/DOS computer. Jaydee can then convert the files so they can be opened with your newer version of Word, Wordpad, Notepad and most current word processing programs. Our conversion services will help you quickly transition to your new system. Some people can't log in because too many users are in the system. CLICK HERE, we have a solution. The compliance date for the ANSI 837 version 5010 was January 1, 2012. Our programs and clearinghouses are ready for the 5010 requirements. If your software is only capable of producing 4010 or NSF, our clearinghouse can still process and convert it. Our Medical Manager clients are now sending claims successfully to all supported payers including Medicare! Secondary claims too! Some carriers may not be ready for 5010. Our clearinghouse can selectively send 4010 claims to the few payers that are not yet compliant. Claims with CTP segments that include procedure description, NDC codes, drug quantity and unit of measure are getting paid. Injections and procedures with J codes including J0713, J2785, J2778, J3300, J3301, J3370, J3396, J3590 and J9035 and Q codes such as Q2035, Q2036, Q2037, Q2038 and nuclear codes A9505 and A9500 also getting paid when sent to Medicare in the 5010 format from Medical Manager. Jaydee knows how to send these claims from all versions of Medical Manager. We can setup a 5010 EDI solution for your practice for almost any software. If you are using Medical Manager Networks Services, Emdeon or SAGE to send your EMC, we now offer a much more powerful HIPAA compliant EMC alternative. If you are not sending electronic claims yet, we can get it going. It works! Fast claim status response and instant eligibility check for most payers. We use Practice Insight, a web based EMC solution. electronic patient statements, eligibility and other valuable features. Jaydee can setup secure remote access to your Medical Manager system through the Internet. Doctors can now have access to patient info and schedule from home or any remote location with an Internet connection at any time. Yes, you can even access Medical Manager from your phone. DRS Enterprise is a fully customizable EMR that can interface with your existing Medical Manager and many other practice management software packages or can be used as a stand alone imaging solution for the "paperless office". Put an end to your shrinking chart room and put all of your charts right at your fingertips, any time, any place! DRS allows you to review records, order tests, review results, write and send prescriptions. ONC-ATCB Certified for meaningful use Stage 2. Your practice can qualify for stimulus money or avoid the penalty for noncompliance. The Medical Manager can be used in a manner that is compliant with current HIPAA's Privacy provisions. Jaydee is implementing HIPAA X12N EDI formats to meet the federally mandated deadlines. Clearinghouse's and insurance carrier's EMC requirements are constantly changing. We can help. We can quickly generate a CSV file or XLS Excel spreadsheet for OUTCOME PQRI / PQRS registry for any desired measures. Overnight! Call now time is running out. We are a full service company providing software, hardware, installation and maintenance for our physicians' office practice management systems. Jaydee Corporation is located in the Chicago area. We currently support practices throughout the country with many configurations, from single user or multi-user Windows to SCO UNIX installations. Jaydee can perform electronic data conversions from many practice management systems for your practice or billing service. We can also create data dumps of your current Medical Manager patients if you are converting to a new billing system. If your practice is in need of support or consulting services, contact us today. 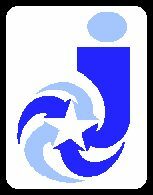 Jaydee Corporation is a founding member of AIMSVAR. Association of Independent Medical Software Value Added Resellers Jaydee is a certified Kroll Ontrack data recovery partner. We can help you recover data from hard disk crashes and failures. We can also help with restoring from backup tapes and data recovery from bad tapes. Jaydee is a managed service provider for Webroot SecureAnywhere® Business Endpoint Protection. It's time to upgrade to a more complete protection. Jaydee Corporation is a member of the Microsoft Partner Network. We support Microsoft operating systems and applications. Our staff has completed OpenServer training. We are a certified source of SCO UNIX support. Medical billing and practice management are rapidly changing. We try to keep our web site up to date and accurate. The Medical Manager is a registered trademark of Medical Manager Research & Development, Inc., a wholly owned subsidiary of Medical Manager Health Systems, Inc. Jaydee Corporation is no longer affiliated with Medical Manager Corporation, Systems Plus, Personalized Programming, Medical Manager Health Systems, WebMD, Emdeon, Vista, Vitera, Sage...(or whatever they are currently calling themselves). Jaydee would like to welcome Greenway to the growing list of companies that have put their name on The Medical Manager. Jaydee Corporation has been named Jaydee Corporation since 1978. Our first Medical Manager installations were on CP/M computers with 8 inch floppy disks. This site copyright (c) 2018 by Jaydee Corporation.